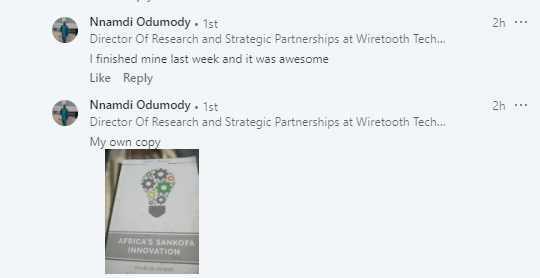 It is amazing as reviews come back very POSITIVE on my book – Africa’s Sankofa Innovation – which is going to be a required textbook next spring in a U.S. university. I want to thank you all and the hundreds who paid $20 to subscribe. We hit close to $50k via Tekedia subscriptions and sales on Amazon. I am confident by 2021, this hobby can grow to $250k. I have asked team to transfer the funds to African Institution of Technology, a tax-exempt charity. By policy, we do not accept grants for our works. We simply do things that bring money to fund whatever we have in mind. My passion now is AI and helping schools deepen that capability. We have been in 102 African universities (see photos). Yes, the funds are available and more programs in schools. I have shared some images of readers who shared great comments on their experiences. More books are coming: the Dangote System is super-awesome, and the Zenzeleni Innovation is a masterpiece. I have been writing while at airports and lobbies as I travel across Nigeria. Visit our store and discover.